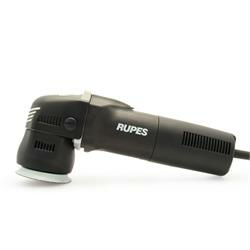 The RUPES BigFoot LHR 75E is THE polisher for difficult shapes and for spot repair operations. The LHR 75E is a must for any detailer wishing to obtain perfect results, even in the most difficult areas. Thanks to the backing pad with small diameter, the LHR 75E is perfect in polishing applications on small and intricate areas. The small machine dimensions and the 12 mm orbit allow a comfortable handling and accuracy in detail polishing. This DA polisher has so far allowed me to detail my small fleet of vehicles to an above average standard of "clean". Even with the fine compound, most of the visible light swirls on the paint were easily polished out, leaving only the deeper ones for the medium compound. The supplied velcro pads are simple to replace while working, and the polisher has the added feature on the back of the body so it can be rested on its back instead of its side. This means no dirt getting onto the pads. Startup is smooth and gradual, meaning less chance of spray if you've put a bit too much compund on the pad, but also means the polisher is controllable and doesn't "kick". Thoroughly recommended, it may be pricey, but feels like it's a good quality machine.